German Chancellor Angela Merkel says a deadly truck attack appears to be intentional. BERLIN, Germany -- 8:35 p.m. The Islamic State extremist group is claiming responsibility for the truck attack on a Berlin Christmas market that killed 12 people and left nearly 50 injured. The Islamic State group's Amaq news agency said in a statement Tuesday that "the person who carried out the truck run over attack in Berlin is a soldier of the Islamic State and carried out the attack in response to calls for targeting citizens of the Crusader coalition." German police are still hunting for the driver of the truck, which slammed into the downtown Christmas market Monday night. Germany is not involved in anti-IS combat operations. But it does have Tornado jets and a refueling plane stationed in Turkey in support of the coalition fighting militants in Syria, as well as a frigate protecting a French aircraft carrier in the Mediterranean. The U.N. Security Council is condemning "the barbaric and cowardly terrorist attack" at a Christmas market in Berlin and calling for the perpetrators to be brought to justice. Council members say "that any acts of terrorism are criminal and unjustifiable, regardless of their motivation, wherever, whenever and by whomsoever committed." A truck drove into the popular market, killing 12 people and injuring nearly 50 others. The council "expressed their deep sympathy and condolences to the families of the victims, as well as to the government of Germany." The German government says Chancellor Angela Merkel has spoken with the leaders of France, Turkey, Italy, Greece, Poland, Sweden and Spain following the deadly truck attack on a Christmas market in Berlin. A government statement says the leaders expressed their sympathy over the attack in the separate phone conversations on Tuesday. They also offered Merkel their support in investigating the attack and "stressed the necessity of European solidarity in the fight against terrorism." German prosecutors say a man arrested after the truck attack on a Berlin Christmas market has been released because there isn't sufficient evidence to tie him to the rampage. Federal prosecutors said Tuesday that that the man, a Pakistani citizen who came to Germany last year as an asylum-seeker, denied involvement in the attack that killed 12 people and injured nearly 50 others. They noted that witnesses were able to follow the truck's driver from the scene but lost track of him. The man arrested matched witness descriptions of the truck driver, but investigators haven't been able to prove that he was in the truck's cab at the time of the attack. Under German law, prosecutors have until the end of the calendar day following an arrest to seek a formal arrest warrant keeping a suspect in custody. German Chancellor Angela Merkel and President Joachim Gauck are attending a memorial service at the church next to the Christmas market that was attacked on Monday night. The nondenominational service at the Kaiser Wilhelm Memorial Church came hours after Merkel and other German political leaders laid white roses outside the church. The church, a centerpiece of the former West Berlin, serves as a symbol of the destruction of war. The 19th-century church was badly damaged in World War II bombing and the remains of its spire were left standing. A modern extension was inaugurated in 1961. Berlin's Lutheran bishop, Markus Droege, said "Berlin lives with this wound, which was created by violence and war. This church is a memorial - it shows us what happens when people give free rein to their hatred, when they pursue the path of violence to the end." A German Muslim group is condemning the truck attack on a Christmas market in Berlin that left 12 people dead. The Muslim Coordination Council said in a statement Tuesday that terror "does not stop in the face of innocent people and what is sacred to people." It added that "we are deeply shocked and condemn the cowardly attack in the strongest terms." The council is an umbrella organization for several German Muslim groups. German authorities are calling the truck attack an "act of terrorism" that had all the hallmarks of Islamic extremism, but many questions remain over who carried it out. No group has claimed responsibility. The White House says President Barack Obama has spoken by phone with German Chancellor Angela Merkel and offered his condolences for the attack against the Berlin Christmas market. Twelve people were killed and nearly 50 others injured when the truck drove into the popular Christmas market filled with tourists and locals outside the Kaiser Wilhelm Memorial Church near Berlin's Zoo station late Monday. The White House says Obama reiterated a U.S. offer of assistance. He also underscored that "no attack could sway our determination and that of our German allies to defeat terrorism in all of its forms." The White House says Obama also expressed his appreciation for Merkel's steadfast leadership in shared efforts to "root out the scourge of terrorism and defend our way of life." An Italian lawmaker says after the Berlin truck attack the list of possible targets in Italy will likely expand. Sen. Giacomo Stucchi, the head of Parliament' intelligence commission, told Sky TG24 TV Tuesday that also likely to grow will be the number of persons deemed needing to be closely watched as possible extremists. Stucchi says "zero risk doesn't exist." But he is urging Italians to continue to enjoy their public piazzas and attend their churches in the predominantly Catholic country. German authorities say the truck deliberately was driven into a Christmas market filled with strollers and shoppers in Berlin Monday night, killing 12 people and injuring dozens. Romania's prime minister is sending condolences to the families of those killed in the attack on the Christmas market in Berlin and calling for renewed efforts to fight terrorism. In a message Tuesday, Premier Dacian Ciolos says the Romanian government "condemns such acts of unspeakable violence against innocent people." Czech leaders say the country is increasing security measures following the truck attack in neighboring Germany. Prime Minister Bohuslav Sobotka says the police presence will be "massive" during the Christmas holidays, on New Year's Eve and New Year's Day at places where crowds gather. Interior Minister Milan Chovanec says hundreds more officers will be deployed in the capital and across the country. He says police are ready to renew checks on the border with Germany if German authorities request that. France's lawmakers and government members have observed a minute of silence to express their solidarity and compassion toward Germans. Prime Minister Bernard Cazeneuve, in a speech to the lower house of Parliament, vowed to use the strongest determination to fight terrorism "without truce or pause." He says French and German authorities have worked closely for months to help improve security in both countries following the deadly attacks by Islamic extremists last year in Paris and this year in Nice. Chancellor Angela Merkel and other senior German officials have laid white roses at the site of Monday's attack on a Christmas market in Berlin. Merkel was joined by Interior Minister Thomas de Maiziere, Foreign Minister Frank-Walter Steinmeier and Berlin Mayor Michael Mueller at the site near the Kaiser Wilhelm Memorial Church in central Berlin on Tuesday. They spoke with police officers at the market then signed a book of condolences at the church. Twelve people were killed in what authorities are treating as a terror attack. Italy is strengthening security measures for areas where crowds are expected for Christmas ceremonies, such as Pope Francis' appearance in St. Peter's Square. Interior Minister Marco Minniti led a meeting Tuesday of the heads of Italy's police and intelligence forces to review security after the truck attack on a Christmas market in Berlin. An interior ministry statement does not specify the places where security will be tightened. But security officials in the past have said that extremists have noted the Vatican, as a symbol of Christianity, is a logical target. The head of Germany's Federal Criminal Police Office says he cannot rule out that suspects involved in the truck attack on a Berlin Christmas market could still be at large. Holger Muench told reporters Tuesday that authorities are still not positive the suspect they have in custody was the driver of the truck, that they have not yet found a pistol believed used to kill the truck's passenger, and that it is not known overall how people were involved. For those reasons, he says, we are "naturally on high alert and are investigating in all directions." He says six of the 12 people killed have been identified and are all Germans, but he does not yet know whether the other six are as well. Germany's top prosecutor says investigators are treating the Berlin Christmas market attack as an act of terrorism, though there is no claim of responsibility yet. Peter Frank also told reporters Tuesday it's not entirely clear whether there was one perpetrator or more. He says the suspect in custody "may not have been the perpetrator or belong to the group of perpetrators." 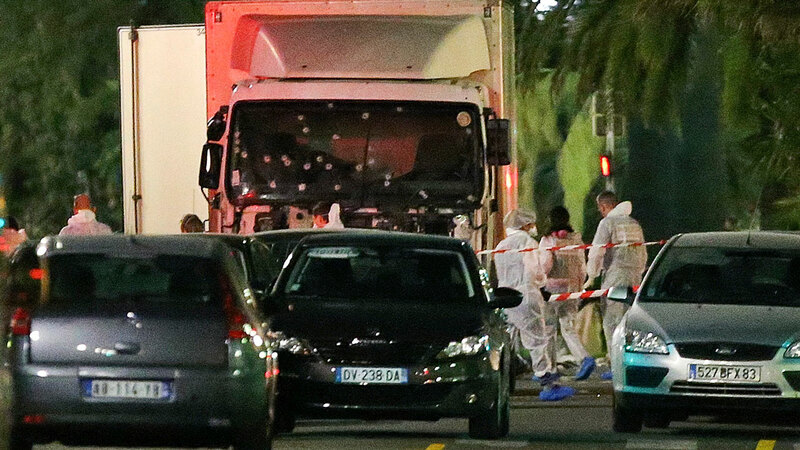 Frank says the method used in the rampage was reminiscent of July's truck attack in Nice, France and of the "modus operandi" used by Islamic extremist groups. Pakistan's Prime Minister Nawaz Sharif has expressed his grief over the deaths in the attack on a Christmas market in Berlin. In a statement, he says that "terrorism is our common enemy and the world needs to put up a joint fight against this menace." Sharif says Pakistan will continue to take steps to eliminate terrorism, as his country also has been a victim. Police detained an asylum-seeker from Pakistan shortly after Monday's attack, but he denied involvement, Germany's Interior Minister Thomas de Maiziere said. Berlin police chief Klaus Kandt said it wasn't clear whether the man was really the truck's driver. Pope Francis is urging those of good will to fight the "folly of terrorism." In a condolence telegram Tuesday to Berlin's archbishop, Francis prays for the dead and injured in Monday's attack on a Christmas market in Berlin. He says he joins "all men of good will" who have committed themselves to efforts "so that the murderous folly of terrorism finds no more room in our world." Francis also prays for the 12 persons who were killed and for the many wounded in what he called "the terrible act of violence." Berlin's police chief says it isn't clear whether the man detained in the wake of Monday's fatal truck attack on a busy Christmas market was really the driver. Klaus Kandt told reporters in Berlin that "we haven't been able to confirm it yet." Twelve people were killed in the attack. The owner of a Polish trucking company says the driver who was the first victim of the attack on a Christmas market in Berlin was stabbed and shot to death in the cabin of his truck. Ariel Zurawski says German authorities asked him to identify the victim, Lukasz Urban, 37, from photos. "His face was swollen and bloodied. It was really clear that he was fighting for his life," Zurawski said, speaking to broadcaster TVN. Lukasz Wasik, the manager of the trucking company, described Urban as a "good, quiet and honest person" devoted to his work. "I believe he would not give up the vehicle and would defend it to the end if were attacked," Wasik said in comments carried by TVP, Poland's state broadcaster. Germany's top security official says a suspect arrested after the truck attack in Berlin "comes from Pakistan" and had applied for asylum. Interior Minister Thomas de Maiziere told reporters Tuesday that the suspect entered Germany on Dec. 31, 2015, and arrived in Berlin in February. He says that so far authorities have no knowledge of a claim of responsibility from the Islamic State group. Germany's top security official says authorities have "no doubt" that the fatal ramming of a busy Christmas market in Berlin on Monday was an intentional attack. Interior Minister Thomas de Maiziere says 12 people were killed. Among the dead was a Polish citizen found on the passenger seat of the truck with a gunshot wound. De Maiziere told reporters on Tuesday that a man arrested in connection with the attack has denied to police that he was involved. Danish and Norwegian police have increased their presence at Christmas markets in the countries' capitals, Copenhagen and Oslo, following the deadly attack in Berlin. The prime minister of Finland, Juha Sipala, said Monday's attack that killed at least 12 people "was (an) evening of absolutely shocking news and senseless violence." Polish Prime Minister Beata Szydlo says it is "with pain and sadness we received the information that the first victim of this heinous act of violence was a Polish citizen." Szydlo told reporters that Monday's attack on a Christmas market in Berlin is a reminder that "Europe must become unified in the fight against terrorism and Europe must take effective action to protect its citizens." German Chancellor Angela Merkel says she is "shocked, shaken and deeply saddened" by the attack on a Berlin Christmas market that killed at least 12 people Monday. Merkel told reporters on Tuesday that it would be "particularly sickening" if it turns out the attacker was an asylum-seeker who sought refuge in Germany. German media have reported that a suspect arrested after the attack was a Pakistani citizen who came to Germany in late 2015 or early 2016. German Chancellor Angela Merkel has spoken with U.S. President Barack Obama, who expressed his condolences in the wake of the fatal attack on a Christmas market in Berlin. At least a dozen people were killed when a truck rammed into the busy market in the German capital in what police described as a suspected "terror attack." Merkel's office says the two leaders spoke by phone early Tuesday, and Obama assured the chancellor of America's full support in investigating the attack. London's Metropolitan Police say they are reviewing security plans for public events over the holidays after Monday's attacks in Germany and Turkey. Police said Tuesday they are considering "a range of threats, including the use of large vehicles." Police say it is routine to review security plans after attacks overseas. Berlin police are stepping up armed patrols in response to the fatal attack on a Christmas market Monday. Police said Tuesday on Twitter that the measure is being taken "as a precaution." At least a dozen people were killed when a truck rammed into a busy Christmas market in the German capital in what police described as a suspected "terror attack." Berlin's top security official is calling for Christmas markets in the city to remain shut on Tuesday after Monday's attack that killed at least 12. Germany's Interior Ministry says Berlin's state interior minister, Andreas Geisel, told federal and regional counterparts that operators of Christmas markets in the capital were asked to close out of respect for the victims and their relatives. The ministry says the officials agreed that Christmas markets and other major events across Germany should go ahead and that decisions on tightening security measures should be made locally. The federal interior minister, Thomas de Maiziere, said: "Whatever we find out going forward about the exact background motive of the perpetrators, we must not and will not allow our free life to be taken away." Police in the English city of Manchester say they are increasing patrols of many popular Christmas markets following the attack in Berlin. Police said Tuesday they had added extra protection at the 10 market sites, which are often thronged with shoppers in the days before Christmas. Assistant chief Debbie Ford says the increase is in line with Britain's "national response." The country's terror threat has long been judged to be severe, meaning an attack is highly likely. She says there is no intelligence suggesting an attack in greater Manchester is imminent. German police have searched a large shelter for asylum-seekers in Berlin in response to the fatal attack on Christmas market Monday. The dpa news agency reported Tuesday that up to 250 officers took part in the operation at the now-defunct Tempelhof airport overnight. It quoted a spokesman for Berlin's office for refugee affairs, Sascha Langenbach, saying four men in the late 20s were questioned by police but nobody was arrested. Several German media, citing unnamed security sources, reported that the suspect in the attack was a Pakistani man who entered Germany late 2015 or early this year. Police declined to comment on the reports, referring questions to federal prosecutors who didn't immediately respond to calls Tuesday. Germany's top security official is ordering flags at federal buildings to be flown at half-staff in the wake of Monday's truck attack in Berlin. Interior Minister Thomas de Maiziere said in a statement Tuesday that the decision was taken as a mark of sympathy following the attack. Authorities say at least 12 people were killed and almost 50 injured when a heavily laden truck slammed into a Christmas market in the west of the German capital. There's no specific threat in NYC stemming from the incident in Berlin, but as a precaution, the NYPD is moving heavily armed Critical Response Command officers toward these displays.